Traumatic brain injury (TBI) affects over 10 million people every year, including over 22,000 Australians. It’s also one of the leading causes of death and injury for young people, and has been implicated in the development of neurodegenerative disorders like Alzheimer’s and Parkinson’s disease later in life. Repeated brain injury is very likely the reason Muhammad Ali developed Parkinson’s disease, likely towards the end of his boxing career. 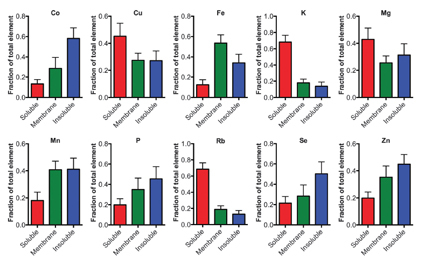 We’ve just recently published a Communication over at Metallomics describing how, in the brains of people who died as a result of TBI, levels of soluble cobalt (Co) are significantly increased. We looked at a range of different metals, including Co, copper (Cu), iron (Fe), magnesium (Mg), manganese (Mn), phosphorus (P), potassium (K), rubidium (Rb), selenium (Se) and zinc (Zn) in the brains of 27 people who died from a range of causes, all resulting in a major brain injury, aged from 17 to 78 years old. The tissue was obtained from the Australian Neurotrauma Tissue and Fluid Bank. Comparing between healthy control brains and those that suffered the injury, only Co showed any significant difference between groups. All other metals were comparable to one another in both groups, suggesting that metal levels alone are not indicative of anything amiss after traumatic brain injury. The brains we were examining could be divided into 4 groups, and the controls: ‘acute’ injury, where death occurred in less than 17 minutes; ‘early’ injuries, where death occurred between 30 minutes and 3 hours of the injury; the ‘late’ group, where survival time was between 6 hours and just over 5 days; and the ‘late-non injured’ group, which included corresponding brain regions from the ‘late’ group’s non-injured side. 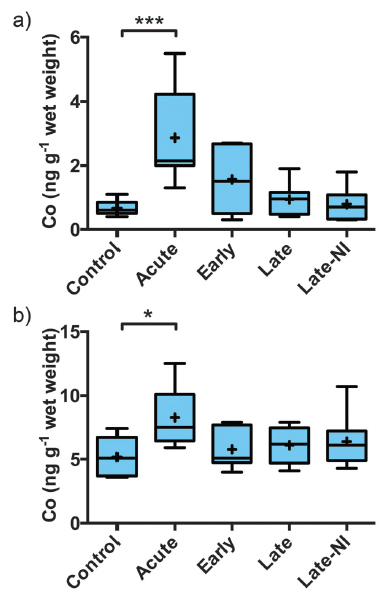 Interestingly, Co was only elevated in the ‘acute’ injury group, suggesting that changes in Co happen nearly immediately following injury, and that they returned to normal levels within 6 hours of the injury occurring. This change was most pronounced in the soluble fraction (a), but when we looked at total Co levels the change was still obvious (b). What’s the significance of this? We’ve previously shown that simulated sleep apnea in mice also causes an increase in Co (you can read the article published in Sleep here), and were able to specifically identify the source of this Co as being vitamin B12. We’re not really sure why Co increases after brain injury, though several theories abound, including the rapid influx of proteins needed to help repair cells, and signs that neurons are in distress, and we’re now looking into why and where these increases in Co occur in a mouse model of traumatic brain injury (so stay tuned! ).